Australian blogger Annie Nolan grew tired of insensitive questions about how she conceived her twins, so she turned to Instagram to answer them once and for all. Love it or hate it, when you have a baby, strangers are bound to ask you questions. And apparently, according to Australian mom Annie Nolan, if you have twins, you'll get double the interrogation. 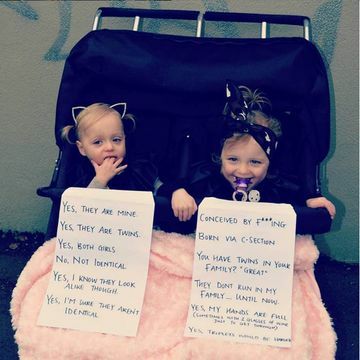 Nolan, who is a blogger at Uncanny Annie and has fraternal twin toddlers, Delphi and Cheska, says while strangers mostly mean well when they comment on her twin girls, it can be exhausting to answer their many questions. The solution? Create a carefully written note that preemptively answers any burning questions and post it to Instagram: "Yes, they're twins." "Yes, they're both girls." "No, not identical." And: "Born via c-section." Though Nolan didn't actually get up the nerve to keep this answer-sheet attached to her stroller, she did consider it. Turns out, Nolan isn't the only parent of a twin to feel this way. Alice Dubin, a Los Angeles-based mom to 1-year-old boy and girl fraternal twins, Jordan and Maya and writer behind Parents magazine's Everything Pregnancy blog, says she's gotten used to the inquisitiveness of strangers. "People will say 'you must be tired/busy/broke,' and for that one, I always say: 'Piece of cake! '," she says. "Usually people get the sarcasm and laugh, but occasionally people look at me in awe. And if they're that clueless and humorless, I just let them think I'm serious!" One question that doesn't bother Dubin though? Asking which one is older (if you're curious, her son, by a minute): "It's a legit question, but it does seem, surprisingly, that people care." Some people, though, ask inappropriate questions that would make any parent feel like their privacy is being invaded. Jordan Burleson, dad to 9-month-old fraternal twin boys, Landon and Evan, in Winston-Salem, N.C., says his least favorite question is: "Were they natural or did you use fertility drugs?" While it's true that multiples can be more common with drugs, many couples conceive twins without assistance. Burleson says most people want to know if twins run in their family—another factor that could make multiples more likely. But apart from the personal questions, mostly, people are curious: "They ask my wife, Paula, if she has her hands full and shout 'Oh, double trouble' and sometimes, they even ask us why we don't dress them alike," he says. "When they ask how we do it or if we're tired, and quickly follow it up with 'better you than me! ', I wonder why they talk to us at all!" The next time you feel the urge to know everything about the cute twins you pass, hold your tongue. They've likely already answered whatever you're wondering at least 20 times before coffee. And if you're about to have twins of your own, you might want to start memorizing those comebacks.